One twelve inch grapevine wreath. 1. 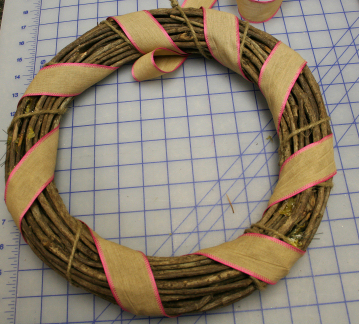 Wrap ribbon as desired around your grapevine wreath and hot glue in place. 2. Embroider 3 of each of the large and medium size of the daisies. For each: hoop the lightweight, tear away stabilizer and burlap. (or hoop just the stabilizer and adhere squares of the burlap on top.) 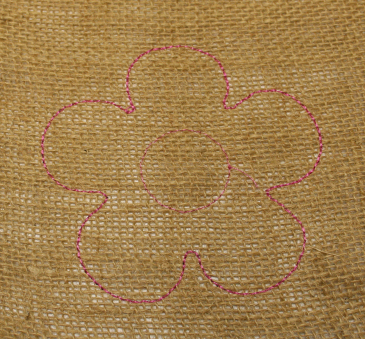 Embroidery the daisy outline. 3. Remove from the hoop. Carefully remove the stabilizer. Cut roughly around each daisy outline creating raw edges. 4. Embroider 3 the small size of the daisies. For each: hoop the lightweight, tear away stabilizer and burlap. (or hoop just the stabilizer and adhere squares of the burlap on top.) Embroidery the small daisy outline. 5. 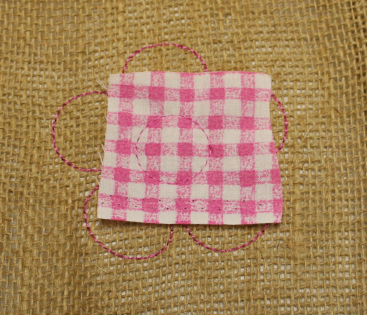 Using the lapel stick adhere the corners of a small square of your fabric over the center of the daisy outline. Embroider the center. 6. Remove from the hoop. Carefully remove the stabilizer. Cut roughly around the center and then around the daisy outline creating raw edges. 7. Glue the daisy centers together with the smallest on top and largest on bottom, making 3 daisies. Glue onto your wreath as desired. 8. Embroider the heart outlines. Hoop the lightweight, tear away stabilizer and burlap. (or hoop just the stabilizer and adhere squares of the burlap on top.) Embroidery the first heart outline. 10 Remove from the hoop. Carefully remove the stabilizer. Cut roughly around the center heart and then around the burlap heart outline creating raw edges. 11. 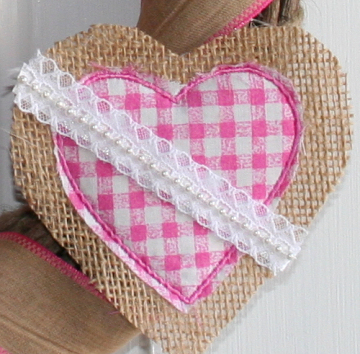 Cut a piece of ribbon or lace to fit your heart and glue in place. Glue the heart to the wreath as desired. 12. Embroidery a monogram letter that is almost 4" tall. I layered the stabilizer, pink gingham, and then burlap on top for the one I made. Cut out leaving raw edges. Glue ribbon to back and to the top of the wreath. This could make a cute decoration for one of those burlap bridal showers that are so popular right now. 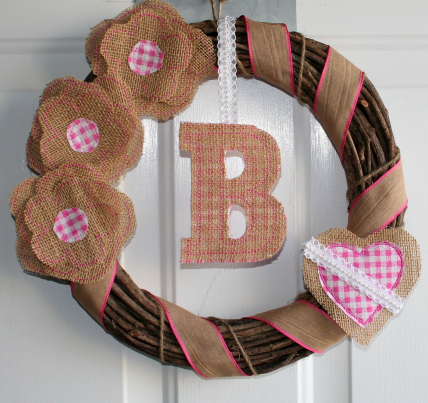 Or even a baby shower decoration with the baby's name on the heart. If you create other uses for the outline daisies or heart please post them in Annthegran's gallery so we can all share your inspiration. I hope to add a burlap welcome banner for my long planter and pot wrap to complete my spring porch. What do you have planned to celebrate the coming of spring? Whatever it is make it fun.